Stop it with all your excuses about, “if only I had more time”, “I’ve got too much going on in my life”, “I’m too busy”, “someday I’ll…”, etc. Kids, relationships, family, education, careers, health, hobbies, happiness… You will always make time for the things you truly want and all the excuses in the world won’t change that. I’m just as guilty as everyone. But no more. I’ve spent the last year strongly focusing on working on myself and on becoming the person I truly want to be. I’ll spend the rest of my life continuing to do so. I can honestly say that for the first time in my life I truly love myself and who I am. I am so happy with my life. Not because it’s perfect, because it definitely isn’t, but because it’s mine. And I’m done making excuses. I truly want to be happy. It’s not something that just happens, despite all my protests that it does. You have to work at it. You have to make time for it. You have to make time for you and the things that you truly want. This, and every year, is my year. I am prioritizing and making time for the things I truly want – My kids. My education. My happiness and all the things that fall under that. 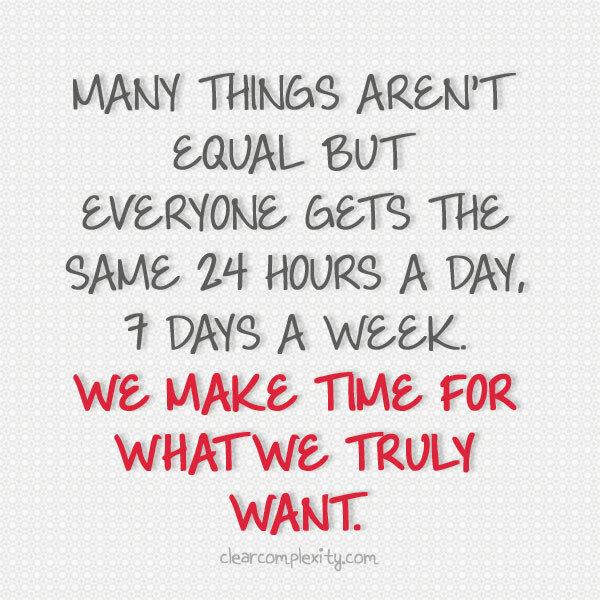 Make the time for what you truly want. This entry was posted in Self-growth and tagged acceptance, awareness, change, choice, knowledge, loving yourself, priorities, self-growth on January 10, 2015 by Lyndsey.